The trustees of the Anandashrama of Poona have rendered a signal service to the cause of promoting the study of Hindu political theory by undertaking the publication of the Nitisara of Kamandaka. The first volume of this important Sanskrit work on political science is being issued herewith along with its two celebrated commentaries. The remaining portion of the work (which is considerably larger in length than the one now being presented) will be published in a year or so from now as the second volume. Although the Nitisara of Kamandaka was formerly published several times and from different places, yet copies of none of these editions are at present procurable from book shops dealing in such publications. Two of its notable editions were published respectively, in (1) The Anantashayanam Sanskrit Series of Trivendrum, and (2) the Bibloethica Indica Series of Calcutta. 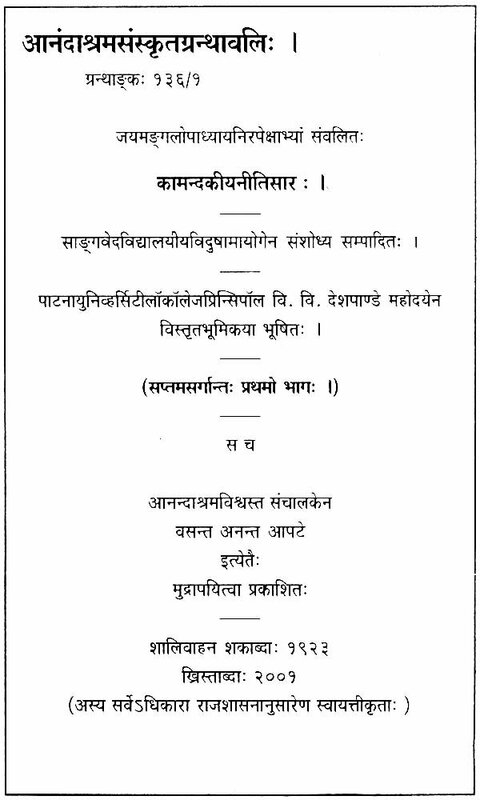 The former of the two was edited by the late Mahamahopadhyaya T. Ganapathi Shastri, and contained the text of the commentary, the Jayamangala of Shankararya. 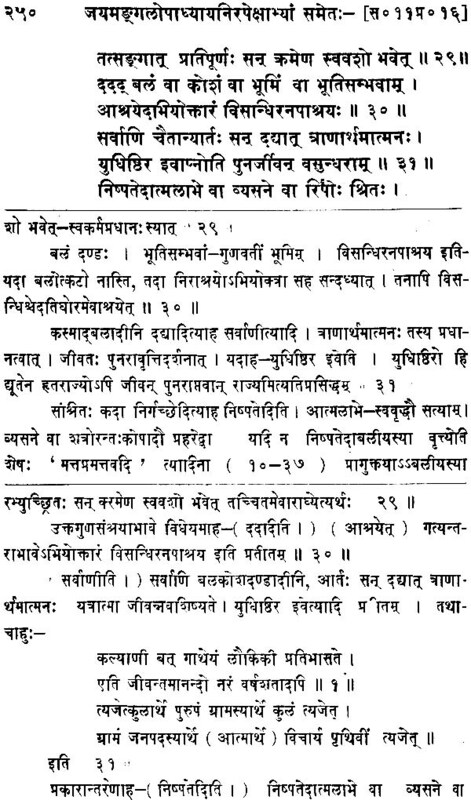 The Bibloethica Indica edition gave certain excerpts, and at several places even editorially remodeled passages from the other commentary, the Upadhyaya Nirapeksha. The Trivendrum edition of the work is very accurate and bears all over itself the stamp of the deep scholarship of its learned editor, the late T. Ganapathi Shastri. The same however cannot be said of the Bibloethica Indica edition. This edition contains several inaccuracies and misstatements. The editors have in some places given their own reconstructs of obscure and difficult passages of the Upadhyaya Nirapeksha. The present Anandashrama edition has given the full text of both the commentaries. Thus the whole of Upadhyaya Nirapeksha is, for the first time being made available to the student of political science. From a comparative study of both the commentaries it will be obvious that Upadhyaya Nirapeksha is, at several places, more useful in clarifying obscure passages of the Nitisara than Jnyamangala. Further, it often gives a more detailed explanation of the text of Nitisara. Hence it is bound to prove more valuable to the student in his efforts to understand Kamandaka's epitome of Kautilya's classical treatise. 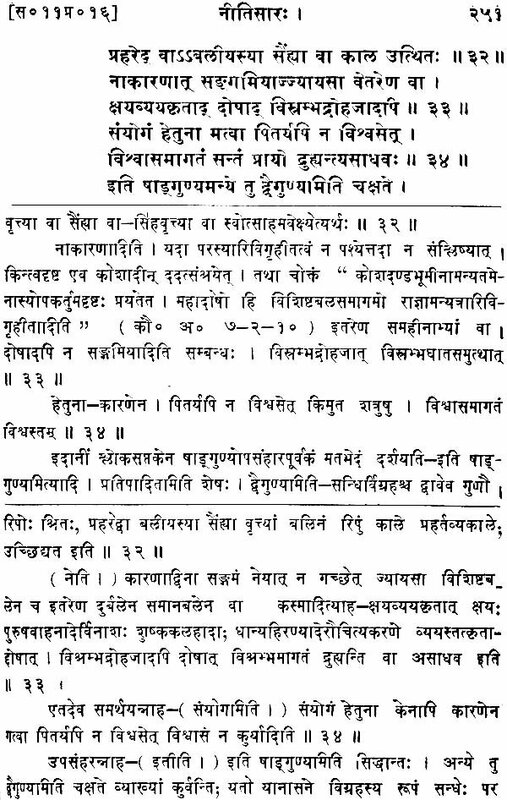 The publication of the accurate edition of the Upadhyaya Nirapeksha was therefore a great desideratum. Unfortunately, the study of Raja Nlti Shastra as an integral part of Sanskrit learning has, for centuries, been neglected in the Pathashalas run on traditional lines. As a proof of this, we know neither any standard work nor any reliable commentary on the subject has been composed during the period of last three hundred years. In recent years the strong Hindu movement against various governmental measures of social reform was responsible in giving an impetus to the study of this important branch of Sanskrit learning. The task was seriously undertaken about twelve years ago by the learned Pandits of the Sanga Veda Vidyalaya of Banaras. The main aim of their study was to qualify themselves for the preparation of a Constitution of free India based on orthodox Hindu social and political theory. The preparation of this edition has thus cost enormous intellectual labour, spread over a considerable period of time, of a band of devoted Pandits. This study was carried on under the guidance arid leadership of the great Panditrai Sri Rajeshwar Shastri Dravid, 'Pandit' Sri Gana- pathi Shastri Hebbar, among this group, has rendered special service in collating, correcting and at places, even discovering the correct readings from different manuscripts of the Upadhyaya Nirapeksha. All lovers of Sanskrit learning owe a deep debt of gratitude to this band of Banaras Pandits for the sustained and untiring efforts they have brought to bear on the preparation of the Anandashram edition. The proper understanding of political theory as developed by Sanskrit works is no easy task and I feel no hesitation in stating that only very few of the thirty and odd English books on the subject recently brought out by modern Ideologists and students of political science give a correct statement and evaluation of this theory. The undertaking of this task demands deep knowledge of not only the three interpretative sciences, viz Nyaya, Mimamsa and Vyakarana but of other branches of Sanskrit learning as the Dharma Shastra the Sahitya Shastra, the other Darshanas and the Itihasa and the Puranas. The Ideologists and other adventurers in the field can, at the most, lay claims only to a close acquaintance with the facts of ancient and. medieval Indian History and a good knowledge of classical Sanskrit literature. They are more concerned with raying emphasis on their respective interpretations of the theory than with taking the trouble to understand the traditional point of view. They have not 'shown any anxiety to expound the theory in a way that would help the establishment of coherence and accord between the different branches of Hindu learning. This task could be undertaken with justification and authority only by such renowned Pandits as Panditraj Sri Rajeshwar Shastri and his learned disciples. It is to be earnestly 'hoped that the publication of this work under such encouraging auspices shall help in rejuvinating the study of Hindu political theory, one of the four branches bf Vedic Purushartha Vidyas. It is a always difficult task to introduce a new subject even to the class of intelligent readers because of their unfamiliarity with any of its aspects or ramifications. To some extent this is true of Hindu political theory. The present writer wrote thus in his foreword to the first part of the work (published six years ago, in 1958) “unfortunately the study of Raja Niti Shastras as an integral part of Sanskrit Learning has for centuries, been neglected in the Pathashalas run on traditional lines.” Sanskrit Pandits are there for unfamiliar with its study. But it is more so with the modern type of scholar. The ways of life and modes of thought of modernly educated Hindus have radically altered and are still changing at such a rapid rate that even the most learned among them are completely at sea with the traditional Hindu way of life and Hindu modes of thoughts. This was not the case say even fifty years back. The aspirations of the average Hindu youth of today’s world in common with others normally lay emphasis on the acquisition of material prosperity power and publicity as these are held to be the indicia of success. So naturally he hugs in tender embrace the ideology of current political theory which seeks to ensure to every individual to highest development of his personality coupled with the guarantee of human dignity. The twin principles of (1) equality : political, social and economics and (2) liberty of thought, expression, belief and also of action (to the maximum extent compatible with the security of the states) have given him the hope of his emancipation. Moreover as a result of the heavy impact of science and technology on the traditional ways of thinking as well as on his everyday life the Hindu youth has become apparently convinced of the truth of the modern claim that all knowledge including even the knowledge of right and wrong just and unjust good and evil on whose basis the scale of values indispensable for the building of any form of organized human life is acquired and can be further augmented or corrected by human beings exclusively by the use of scientific method Viz, the method of observation and drawing inference therefrom. Even if we were to test the most intelligent specimens of modern Hindu youth, we are sure to find in them outright challengers of truth in the tenets of Hindu philosophy, of Hindu religion, and of Hindu way of life. To them these are nothing more than rank superstitions and so they would not consider it worthwhile to spend their time and energy to find out if they are built up on any rational basis. And in addition, the Hindu youth of today sees all round him, and has experience of the multifarious facets of the gigantic, common Indian life in the public sector as well as in his own individual life, being organised on the dogmas and tenets of modern, secular, anti-Hindu philosophy and scale of social values. He has to live in the midst of It he has to become a part of it he has to endeavour to attain his personal success by upholding these dogmas and tenets. Naturally he has neither the inclination, nor the opportunity or time, to know the principles of Hindu philosophy, or the tenets of Hindu way of life. He is usually averse to give any of his thoughts to these matters. Thus there is nothing unnatural if he is completely blank and unfamiliar with the modes of thought and the way of life which inspired Hindu writers to build up their unique political theory thousands of years ago. Hence the task with which the writer of this Introduction is faced is fraught with serious difficulties. He has, therefore, to request his readers for their special consideration, tempered with some degree of sympathetic indulgence. The very first premise of traditional Sanskrit writers, of all places and climes, has always been that no one can ever hope to succeed in evolving a coherent social and political philosophy for organising human life on the data of knowledge acquired exclusively by the two means of cognition, viz. (1) perception, and (2) inference therefrom. The organisation of social life is intended to achieve (1) complete integration of its members, with a climate of mutual affection and trust for each other, leading to the development of sense of oneness (2) complete adherence and loyalty to the eternal social plan and scale of values, thereby assuring the realisation of Rule of Law in every-day life of its members and (3) the bringing about of unflinching faith in the mind of every individual member, of being fully assured of his receiving treatment of perfect justice in his social relations with others. He should also feel a sense of pride in being a member of the community operated by the eternal Vedic plan.